Taking PIONEERING to the next level, join us for the inaugural Husqvarna Motorcycles 701 Enduro Trek: High Country! With a date shift to April 28th – May 2nd 2019, we forge a new path with an adventure ride designed for the Husqvarna Motorcycles 701 Enduro and are set to explore the outstanding High Country region in prime conditions. The High Country offers some of the best adventure riding in Australia, so we have chosen this location for our inaugural pioneering event. Long hill climbs, technical descents, rocky river crossings and sweeping mountain views all add up to make this a great destination to explore on a motorcycle. But this ride isn’t just for any adventure bike: the Husky Trek is for 701 Enduro models only, meaning the strong links that both Husqvarna Motorcycles and the High Country have with history and heritage will play a part in the adventure. Dotted in amongst the hills are reminders of Australia’s pioneering past with cattleman’s huts and relics from early gold mining days: perfect areas for Husqvarna motorcycle rider’s to explore. And just as the Husqvarna 701 Enduro makes a great platform for both new and experienced riders alike, the Husky Trek will be suitable for a wide range of riders. The main route will be achievable for first-time adventurers with a little bit of off-road experience. The optional harder routes will keep things spicy for riders that like to continually challenge themselves. 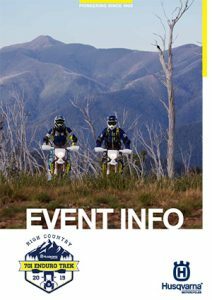 The Husqvarna Motorcycles 701 Enduro Trek is about offering a great experience to our 701 Enduro riders – and what better way to do that than by four days exploring the historic High Country with a pack of 701’s!